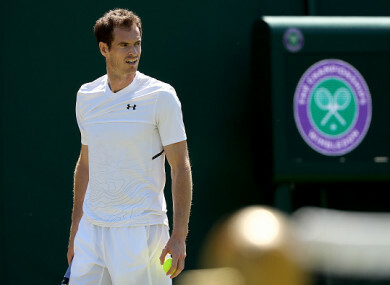 Murray was due to get his Wimbledon campaign underway on Tuesday. THE HIP INJURY which has seen Andy Murray play just three matches in the last year has forced the former world number one to pull out of Wimbledon on the eve of the tournament. Murray made his return to action at Queen’s and Eastbourne over the last few weeks following surgery in January, but has this afternoon announced with a ‘heavy heart’ that the 2018 championships at SW19 has come too soon in his recovery process. The 2013 and 2016 men’s singles champion had been encouraged by his improving performances and having practiced at Wimbledon over the weekend, was due to face France’s Benoit Paire in the first round on Tuesday. However, in a statement Murray said he is still experiencing discomfort and will now focus on getting himself fully fit for the US hardcourt season. “It is with a heavy heart that I’m announcing that I’ll be withdrawing from Wimbledon this year,” he said. “I will start practicing on the hard courts from tomorrow and continuing with my rehab and recovery and I’m looking forward to the US hardcourt season. Really sorry to hear the news, @andy_murray. Email “Andy Murray pulls out of Wimbledon on eve of 2018 championship ”. Feedback on “Andy Murray pulls out of Wimbledon on eve of 2018 championship ”.